What Best Paint Finish For Interior Doors? - Eco Paint, Inc.
What is The Best Paint Finish For Interior Doors? Getting ready painting the interior? Knowing what best paint finish used for interior doors is highly important when painting a home. Important for several reasons, but primarily key to know, so you don't find yourself painting interior doors once again, anytime soon. Of all typical paint manufactures supplying paint today, they all make a paint finish specifically designed for interior doors and trim. This paint finish is most often referred to as Semi gloss. Going a step further, having even a glossier finish is called gloss, or high gloss. The glossier the finish, the easier it is to clean, having more scrubs, not harming the the actual paint coating itself. Knowing inside doors is a very large portion within the home, just as your furniture, dusting & cleaning them is important. Getting a lot of traffic from hands, requiring to consistently clean, wiping down with a sponge and mild detergent, or just lightly go over with a damp wiping cloth. Most doors collect dust just as furniture, and if you dust on a regular basis, doors should be included in the list to dust and clean. Paint sheen that allows this all important cleaning, wiping, and dusting is semi-gloss, gloss, or high-gloss acrylic latex paint, similar to a fine piece of furniture, both being smooth in texture. Glossier paint finishes also allows a furniture polish such as Pledge® or Scott's Liquid Gold to be used after cleaning. Be careful not to use any oils, waxes, or polishes on flat or eggshell paint finishes. Interior doors are made of a harder material than walls themselves, therefore protecting these surfaces better is a semi gloss, gloss, or high gloss paint finish, where it receives the most traffic. 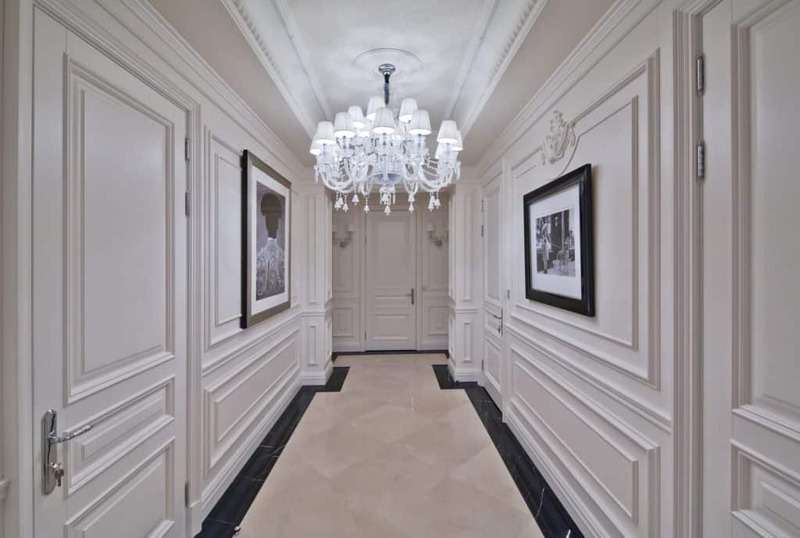 All interior doors listed below are prime candidates for semi-gloss, gloss, or high-gloss finishes. Semi-gloss paint finish is widely used on all interior trim, which includes door jambs, and doors themselves. This finish gives the liberty of rigorous cleaning with a damp cloth, continual dusting. These large surfaces tend to collect dust, similar to furniture within the interior, which requires regular cleaning, and semi-gloss or high-gloss paint finish is best. 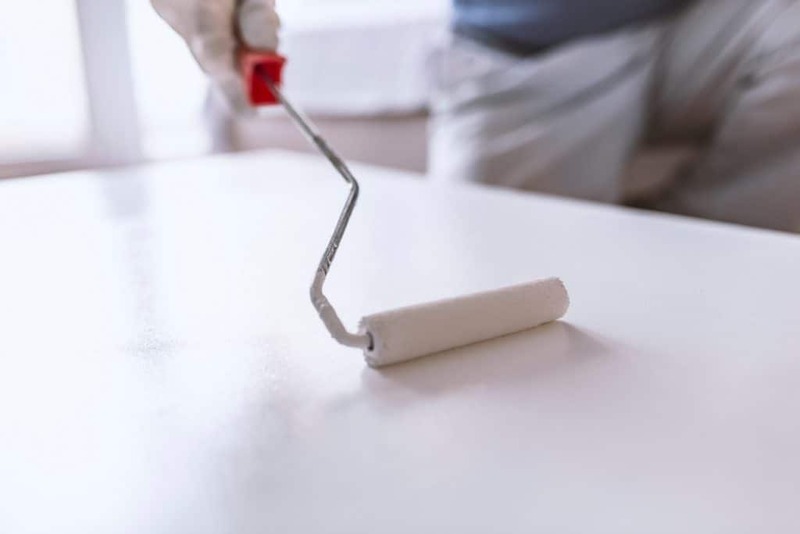 Trim, moldings, baseboards, woodwork, crown, handrails, doors, and casings typically are painted with a semi-gloss paint finish. Allowing far more scrubs, without harming the finish. Some choose to highlight trim even more, using a higher gloss finish. Every clean, uniform, professional looking interior door includes all trim having same finish as baseboards throughout your home. As most trim is lighter than walls, trim finish being a glossier finish than walls & ceilings, highlighting the most important. As for the color of trim, generally trim is same color as ceilings, but having different paint sheen finishes. Ceilings matching the trim color, while having a much flatter finish. 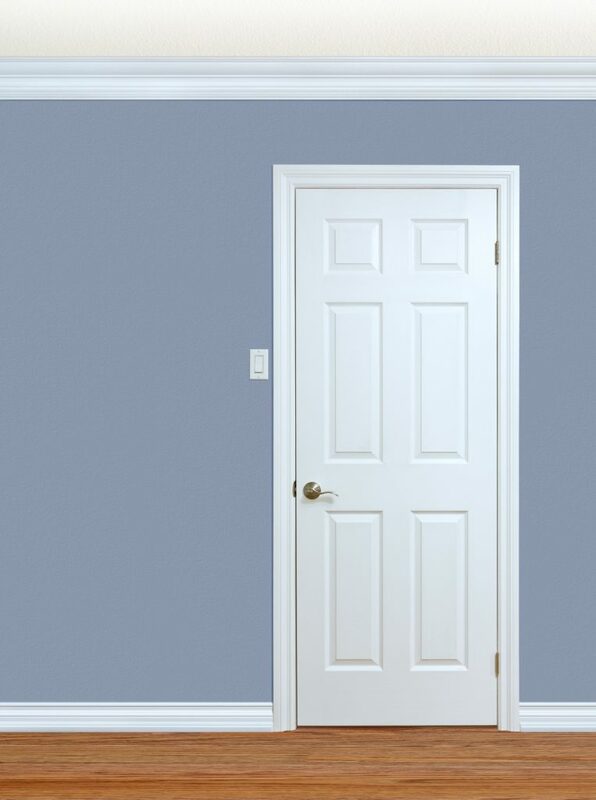 Doors along with trim is a focal point, bringing attention, semi gloss, gloss, or high gloss does just that, whereas flat finishes tend to dissipate, or fade out, going less noticeable. Another very popular paint sheen is semi-gloss. Semi-gloss has a shine to it, on a more dull side than gloss. This sheen is widely used on most wood trim surfaces in the home. Trim surfaces include baseboards, doors, window ledges, handrails, cabinets, and the like. Coming in almost an infinite color selection, this semi-gloss makes it superb cleaning on a weekly or monthly basis. Generally not used on walls, unless in an industrial setting. If you are wanting to bring attention to it, paint it with gloss. Making baseboard really pop, doors shine, and kitchen cabinets come alive. Harder to use, as every spec becomes visible. We generally spay gloss or high gloss paints, just for this very reason. Also coming an infinite color selection, gloss paint sheen is used in the majority of different types of paint formulations, including Acrylic Latex enamels. Making the #1, best paint sheen finish for doors, also trim being semi gloss, for years of enjoyment, and lasting beauty.